'Mr. Simpson, the artist.' (Roger Fenton, 1855). William Simpson (1823– 1899) was a Scottish artist, war artist and correspondent. He arrived in the Crimea on November 15, 1854. While he had missed the early battles, he was able to record the events before Sebastopol. 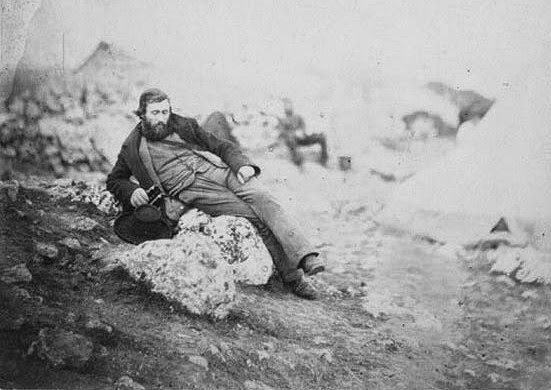 He made numerous acquantances who helped him with details for his pictures, but he was also struck by the plight of the common soldiers, "miserable looking beings...covered with mud, dirt, and rags," he wrote. He hobnobbed with many officers including Lord Raglan and Captain Peel; he also met Roger Fenton who took his photograph. In June 1855, Simpson observed the first attack on Sebastopol. On the night of the 17th, he crawled out of a trench to view the attack. He wrote "It was a wild orchestra of sound, never to be forgotten." He was still at the front when the city finally surrendered, and he quit the Crimea in the autumn of 1855. 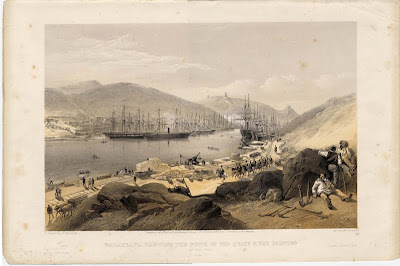 Throughout his time at the front, he would send back his water-colors to London where the lithographers of Day & Son would transfer them to stone. So popular were his pictures that he became affectionately known as 'Crimean Simpson'.